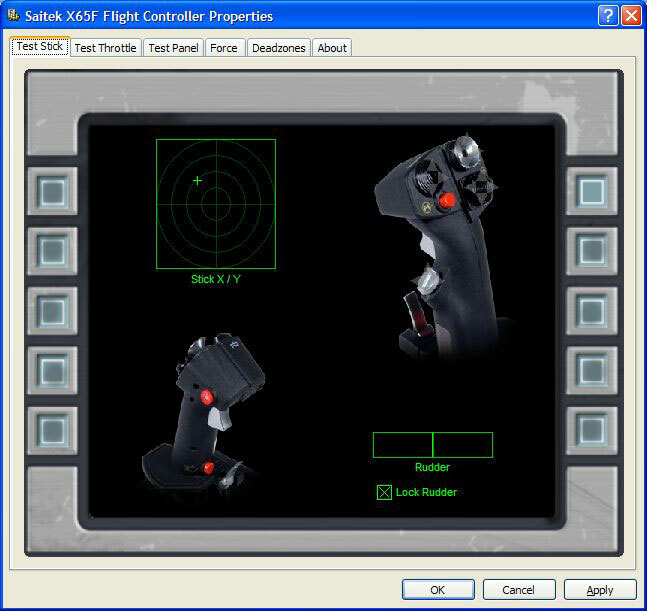 Saitek provides two applications to control the X-65F. The first is the windows controller property page. 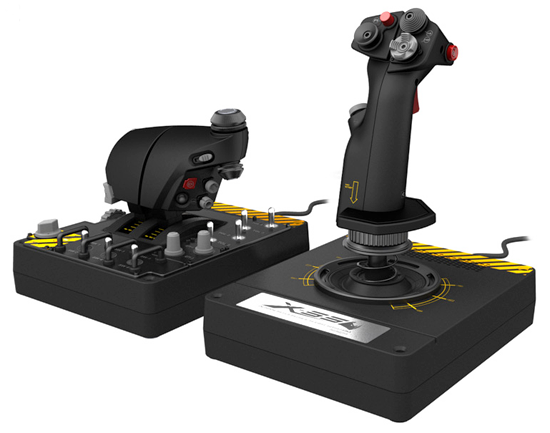 Here one can test HOTAS buttons and axes, adjust force settings, and tweak stick curves and deadzones. 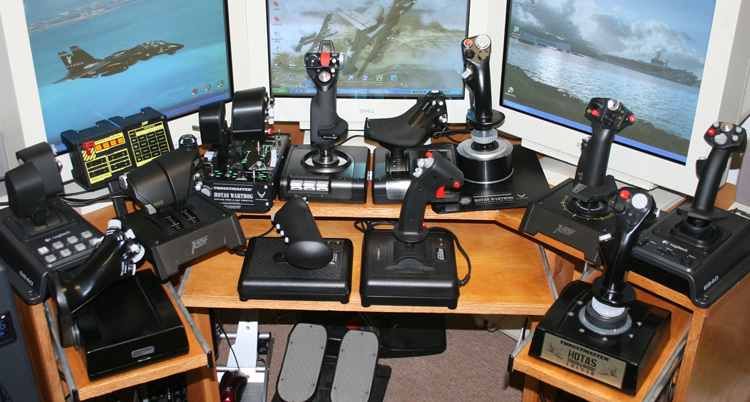 The second is SST (Saitek Smart Technology), the programming software. 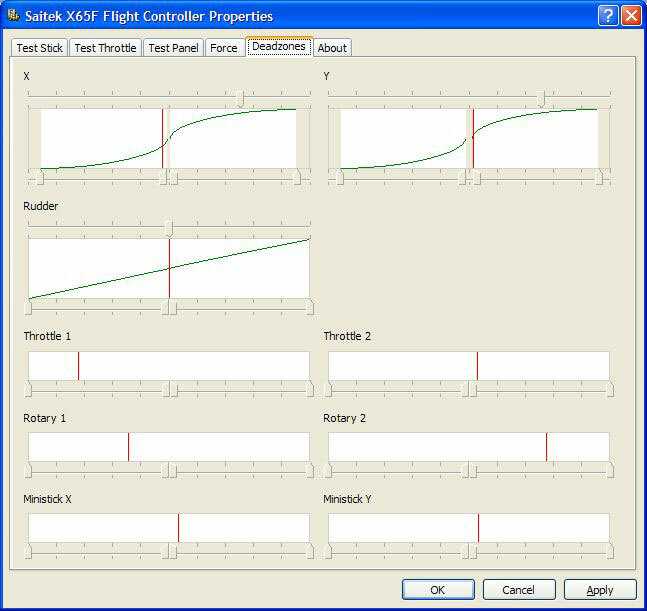 The controller properties offer the option of locking the rudder axis. You will want to do this. Why? Well, I’ve found that it is absolutely impossible to give pitch and roll input to the X-65F’s joystick without giving rudder input as well. This is a problem with traditional displacement-based twist rudders as well, but at least in that situation the user can feel that the stick has twisted and attempt to compensate. With a force-sensing twist rudder there is no displacement and thus no feedback. I tested DCS: Black Shark with and without the rudder locked. Without the rudder locked my helicopter slews all over the sky as if a drunken pilot is at the controls. When I lock the rudder things settle down a lot more. Even if I try to only apply rudder input, the difference in ability to twist right and left with equal strength is in question, since for most people, especially those who are right-handed, it will be much easier to twist to the left due to muscle development. 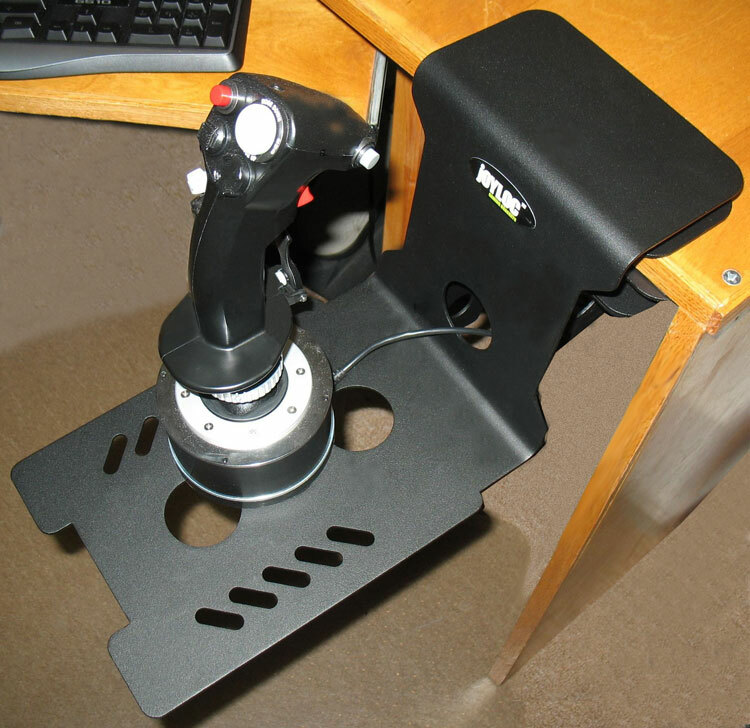 I really question why Saitek included a twist rudder axis at all with the X-65F. Saitek has a fine pedal set product, and they should consider promoting it with the X-65F package. As mentioned previously, the user can select one of four force settings, and the default values for these four settings are printed on a dummy Pro Flight panel. However, these four force settings are also completely user-customizable, and each of the three force-sensing axes can be independently adjusted. Although the printed force values change as the sliders are moved, it would also be nice to have numerical entry fields for these settings so that specific values could be entered from the keyboard. The fact that four different customizable force settings are available is a big benefit to X-65F users. 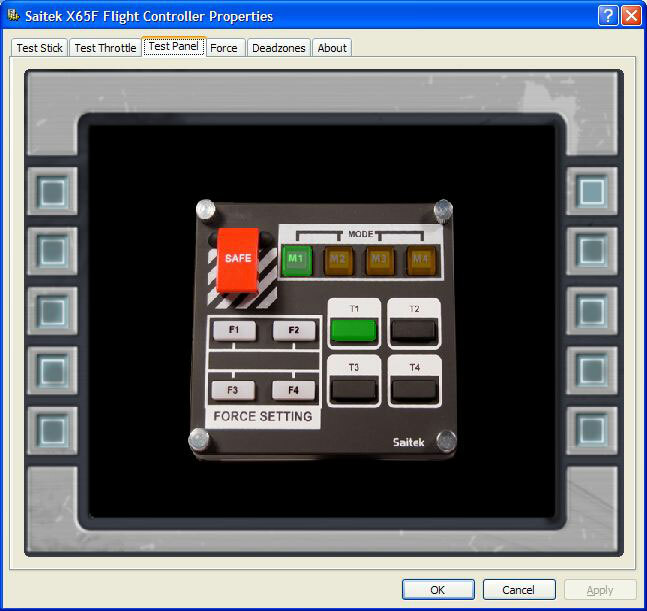 One can set four different force settings for four different types of sims, or different settings for different modes of flight (for example, less sensitive settings to be used for landings). It’s nice to have the four options and not have to go back to the properties window and drag sliders around every time you change sims. The “Deadzones” properties page allows the user to adjust center and edge deadzones for all nine axes, as well as linearity for pitch, roll, and rudder. If one wishes, different deadzones at the top and bottom of each axis can be selected by right-clicking on an axis and unchecking the “Link Deadzones” option. It is nice to see all of these options available, but the adjustments are graphical only. This means it is impossible to match parameters between axes or to revert to previous settings if you don’t like the adjustment you just made. Something Saitek might want to consider is to integrate force settings, deadzones, and linearity curves into the controller profile. This is something that the other HOTAS manufacturers do, and it would result in a more versatile HOTAS with the ability to recall all HOTAS parameters, not just button programming, with only a few simple clicks. During testing I once experienced skewed X and Y axis centering, although the problem was gone after a reboot. 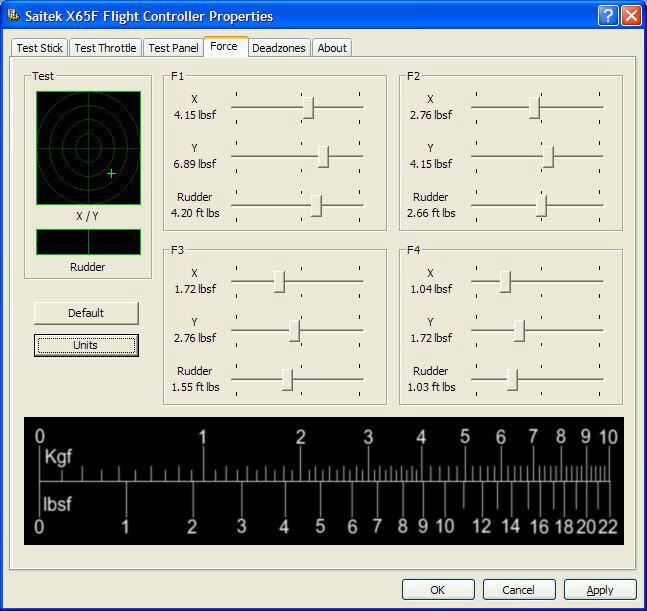 However, when discussing this issue with Saitek we learned that there is no way to calibrate any of the X-65F’s axes. Saitek states that the force-sensing strain gauge electronics should always know where the axis center points are. Despite this, there are six other displacement-based axes on the X-65F (including the two used for the mini-mouse) and the lack of calibration ability is certainly surprising. Time will tell if this is anything about which X-65F users should be concerned. Users familiar with earlier version of Saitek’s SST programming software will notice only the most basic changes made to support the X-65F. 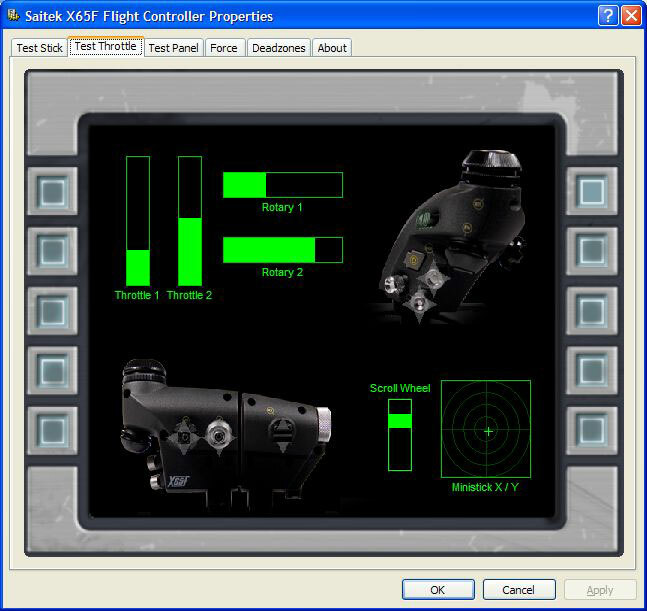 It is possible to look at detailed views of each HOTAS component (stick, throttle, panel), or look at a “grid view” of all of the buttons and axes and their commands assigned per mode. And of course, SST has been modified to support four modes for this device. Other than that, SST for the X-65F is the same as it’s been for a while, which is to say it doesn’t support things like logical programming, axis swapping, and on-the-fly adjustments (although the force sensitivity can be adjusted via the Pro Flight panel, as described above); these capabilities are discussed in detail in SimHQ’s Programmable HOTAS Systems article. Sadly, Saitek’s massive leap forward in hardware quality and design has not been matched by a commensurate step-up in their programming software, which means those users who elect to purchase an X-65F will be spending $400 for a system that is limited in terms of programming when compared to Thrustmaster’s Cougar HOTAS and CH Products HOTAS offerings.